Carnfunnock’s close proximity to Larne and Belfast harbours, makes it an ideal base for touring, not only the breathtaking Antrim Coast and Glens, but all of Northern Ireland. It is also perfect for a relaxing breakaway thanks to its many family orientated attractions and beautiful surroundings. The site is accredited to a 5 Star standard by Tourism NI. On-site facilities include a modern toilet and shower block, fully equipped laundry room, accessible suite, free Wi-Fi, 30 serviced hard stand pitches and grass camping areas for up to 12 tents (subject to ground conditions). No static caravans or tent equipment are available for hire. All campers must check in and register at the Visitor Centre or with the Park Warden before entering the site. Prior to booking a pitch please view the details of the booking arrangements. Advance booking is essential particularly for weekends, bank holidays and during July and August. At the time of booking, full contact details will be required and payment must be received in full. The online booking system will automatically calculate the cost of your stay and allows customers to select a preferred site, based on their specified requirements. The selected site will not be guaranteed until payment has been received. Once payment has been made you will receive an email confirming your booking and site number. If you booked online previously you will be able to sign in using your email address and password. Tent bookings are not available online and may only be booked by telephone or in person, as outlined below. Tent prices are calculated based on the numbers of persons per tent pitch and 6 is the maximum number permitted per tent. Two camping areas are utilised and Park Management will determine tent locations based on bookings, capacity and ground conditions. From Monday 14 January 2019 onwards bookings can be made online or from Tuesday 15 January onwards through The People’s Park reception team on T: 028 2563 3342. From Monday 1 April 2019 onwards bookings can continue to be made online or at Carnfunnock Country Park Visitor Centre, T: 028 2826 2471. 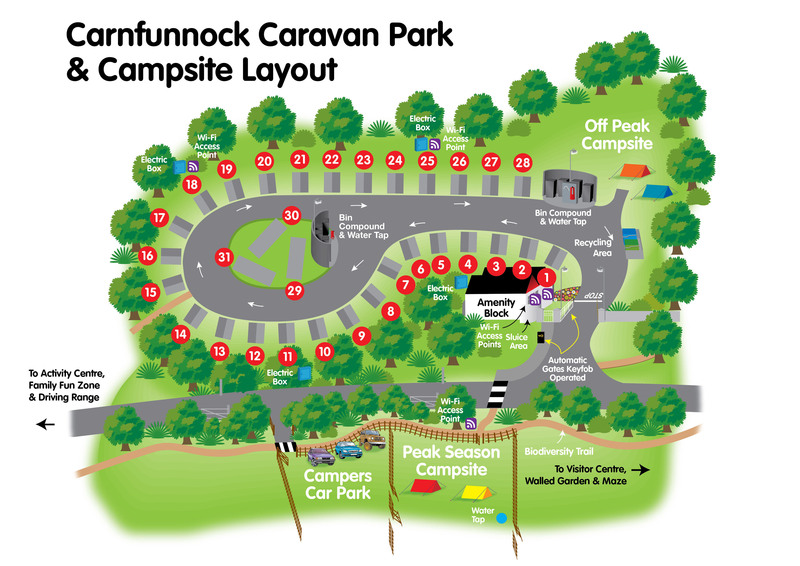 Carnfunnock Caravan Park and Campsite is a family orientated site and all customers are asked not to engage in any activities which may cause annoyance or disturbance to other guests. At the time of booking caravanners may select their preferred pitch, subject to availability and their specified requirements. This is non-changeable. Please see booking conditions for further details. A PDF version of this map can be downloaded below.